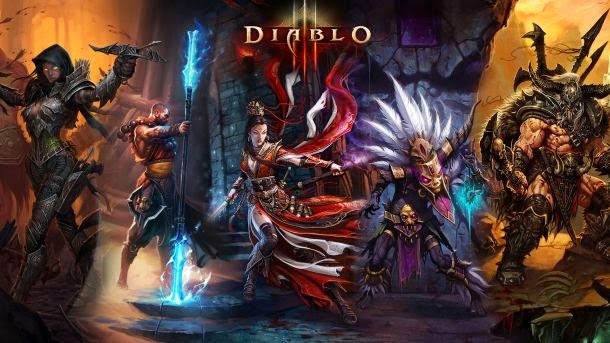 Classes in Diablo 3 progress in a very modern way, both by gifting all of the games’ skills to the player by level 30 (instead of throwing them at a wall of abilities to choose from over the course of 99 levels), and by making six skills available at a time (instead of two). Because of the ability to modify the varied spells with unlockable Runes, the character customization is as robust as ever, even if the level cap is at a much more attainable level 60, as opposed to Diablo 2’s 99. Runes make a huge difference; for instance, they augment the Barbarian’s Bash to include a stun, reverberating knockback, or area-of-effect damage. Every skill is improved with these runes, and it’s possible to create imaginative and unique builds, letting players tune every spell to their liking. Even when you hit the level cap, Diablo 3's Paragon system provides incentive to keep on grinding. While you'll have unlocked all of the Runes and skills, you'll gain access to Paragon points that can be spent on a wide variety of skills. Paragon levels are shared across characters, but each is able to distribute them in different ways, meaning your Wizard can spend all of her points on offense, while your Barbarian can focus on raising his health. It gives you reasons to keep playing, and more incentive to attempt to conquer Diablo 3's highest difficulty modes. Further adding to the customization are the loot drops, which are arguably even more intrinsic to the genre than the RPG elements or the combat. Randomized items tumbling from the corpses of fallen foes help fuel the urge to continue playing, allowing players a second outlet for which they can continuously iterate on their character’s stats, replacing different bits of armor and weapons with slightly better ones. It’s rewarding, and thanks to the closure of the Auction House and the "Loot 2.0" update, it's everything Diablo fans want from itemization. While previously focused on forging an economy where you'd find a near-infinite number of bad items, the new system is more rewarding, and will give you items you actually want to find. Buying items on the Auction House basically ruined the Diablo 3 that shipped on PCs in 2012. Purchasing items off the AH was quick and simple, and, in a way, made finding loot meaningless. Every item we picked up from enemies we’d slain was insufficient to the one we nicked off the AH for ten minutes worth of gold. It broke the genre, but now that it's gone, the new loot system is exactly what everyone wanted at launch. You're swapping out gear every few minutes and finding new things to equip. Every so often you'll find a Legendary item and--surprise--it'll actually be awesome. And now that Blizzard has had time to stabilize the online systems since launch, there are few instances of downtime. Lag is still a problem--and will likely continue to be as the game's popularity rises--but the online system is easy to use, and makes finding games with strangers effortless no matter which difficulty you're on. You’re able to search for people on the same quest as you and join them instantaneously, which makes it a breeze to find groups for difficult sections; even playing with friends has been streamlined and simplified. Those who want to play alone can do so with no pressure to join with others, but it’s just as easy to make sure you’re always running around with two or three party members. Since the game scales amazingly well to the number of players in a game, it means that online multiplayer will always provide an adequately awesome challenge for everyone involved, especially on the harder difficulties. In the 2.0 update, Blizzard also revamped how difficulties work--gone are the days of Normal, Nightmare, Hell, and Inferno, replaced with a new scaling system that's much more transparent. There are still four "core" difficulties that scale monster levels and toughness (and, obviously, reward), but added to the end is Torment, which has six difficulty levels of its own. These new modes are harder, but more fair than the ones the game shipped with, and should keep you playing for an additional few hours as you attempt to topple Diablo. The changes that came with the 2.0 patch transform Diablo 3 into something far more enjoyable, and with much longer legs than the game had at launch. It might not hook you for as long as the original did, as the grind to higher Paragon levels still lacks the inherent joy in climbing towards level 99, but it's still an extremely fun game, and a worthy successor to the Diablo throne. Diablo 3's biggest problems have been solved, and though there are still some kinks network that need to be worked out, it's finally at the stage where I can wholeheartedly recommend it to any fan of the franchise.